President Barack Obama has named Anya Jones, a University of Maryland A. James Clark School of Engineering faculty member, a recipient of the Presidential Early Career Award for Scientists and Engineers (PECASE), the highest honor bestowed by the U.S. government on science and engineering professionals in the early stages of their independent research careers. Jones, whose PECASE nomination was sponsored by the U.S. Department of Defense, has been a member of the Aerospace Engineering faculty at the University of Maryland since 2010. She earned her doctorate in experimental aerodynamics from the University of Cambridge, her Master of Science in aeronautics and astronautics from the Massachusetts Institute of Technology, and a dual bachelor’s degree from Rensselaer Polytechnic Institute in aeronautical and mechanical engineering. “Dr. Jones’ unmistakable leadership in our field so early in her career gives me great hope for the future of engineering and our country,” said Darryll J. Pines, Clark School Dean and Nariman Farvardin Professor of Engineering. Jones is chair of a NATO Research Technology Organization task group on gust response and unsteady aerodynamics and an associate fellow of the American Institute of Aeronautics and Astronautics (AIAA). 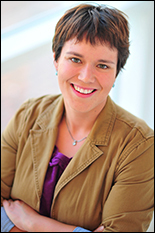 She also serves as a member of the AIAA Applied Aerodynamics Technical Committee, the University of Maryland Energy Research Center, and the Maryland Robotics Center, is a faculty advisor to the UMD Women in Aeronautics and Astronautics, and serves on the Raising Excitement for Science Engineering and Technology (RESET) board of directors. Just this week, Jones was notified that she had received a National Science Foundation Faculty Early Career Development (CAREER) program award for research to improve the safety, reliability, and efficiency of air vehicles by gaining a deeper understanding of the physics of the large flow field disturbances encountered in high winds and gusty flight environments.